In 1978 the NMB (now ING) bank decided to build a new head office. 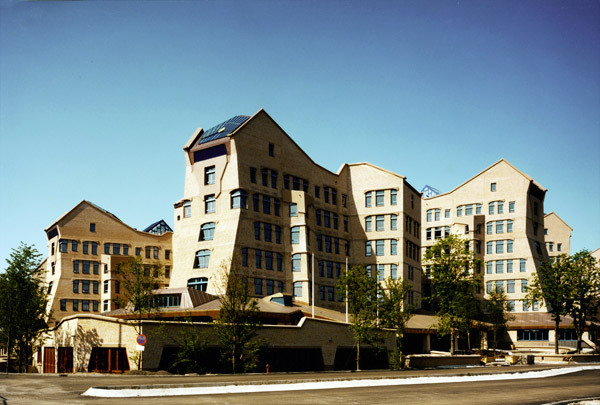 After a preliminary selection, the commission amazingly went to the architect Ton Alberts, famous for his organic buildings and anthroposophical ideas, whose work had until then been largely confined to housing and small-scale social and cultural projects. The final result is a unique building whether in terms of architecture, building physics or social set-up; there is nothing like it anywhere. Regarded sceptically by colleagues and critics it may be, but the public at large has a high regard for this ‘fairytale castle’. The brief’s main points of departure were that the building be functional, flexible and energy-efficient. The traditional bank image of respectability and a sense of tradition were never expressed like this before. Ten tower-like clusters of unequal height are linked at ground level by an internal street. In each cluster, an office floor comprises five work units of 88 square metres and so much meeting space about a void. Upstairs, the clusters are separated by lifts and emergency stairs. The free, oblique forms inside and out are the very nub of the design, in the architect’s view helping the building’s users to be freer and more creative in their work. These shapes, though, are also functional as regards admitting daylight, reducing traffic noise and improving internal acoustics. The forms are, besides, structurally logical and the heavy, solid inner leaf of the cavity wall is in its role of accumulator, a major contributor to energy efficiency. The windows are relatively small. Even though the energy efficiency in fact falls somewhat short of the ambitious expectations, the actual energy used is still extremely low. The general amenities are ranged along the internal street. Natural materials such as stone and wood are exploited in the interior. Each void has its own colour; here water features and plants dictate the ambience, with artworks fully integrated into the building. Beneath the NMB building, which boasts 34,000 square metres of office space for 2500 bank officials, are two levels of parking space. Outside, the cladding is predominantly brick combined with brown precast concrete lintels and blue aluminium window frames. The lozenge-shaped windows in the copper roofs are remarkable in themselves.